선현께 제사지내고 학문을 이어받고자 설립한 조선시대 사립교육기관으로 인조 12년(1634)에 세웠다. 김장생(1548∼1631)을 중심으로 김집, 송준길, 송시열의 위패를 모시고 있으며, 흥선대원군의 서원철폐령이 내려졌을 때에도 없어지지 않은 전국 47개 서원 중 하나이다. 응도당은 학문을 갈고 닦던 강당으로 서원 옛 터에 남아있던 것을 1971년 지금 있는 곳으로 옮겼다. 건물을 옮길 때 기와에 적힌 기록을 발견하면서 오래된 건물임을 알게되었다. 규모는 앞면 5칸·옆면 3칸이며 지붕은 옆면에서 볼 때 지붕선이 사람 인(人)자 모양과 비슷한 맞배지붕이다. 조선 중기 이후 서원 성격 중 강당으로는 보기 드물게 큰 규모를 갖추고 있으며, 옛 양식을 잘 따르고 있는 건물로 강당 건축 연구에 좋은 자료로 평가받고 있다. The Donamseowon Confucian Academy, founded as a private educational institute of the Joseon Dynasty in 1634 (the 12th year of the reign of King Injo), honors Kim Jang-saeng (1548-1631), a distinguished Confucian scholar, along with Kim Jip, Song Jun-gil and Song Si-yeol, all prominent scholars of the same academic lineage. It is one of the forty-seven private Confucian academies that were saved from the decree issued in 1871 by the Regent Heungseon ordering the closure of all the country’s Confucian academies. 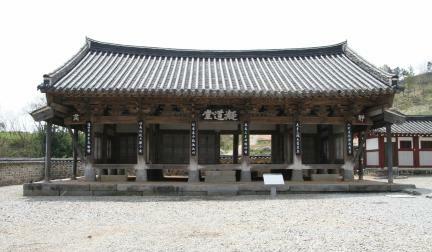 This lecture hall, named Eungdodang, meaning ‘Hall of the Solid Way’, was moved from its original site at the academy to its present location in 1971. During its relocation, the building’s function as an ancient academic hall was revealed by the chance discovery of an inscription on a roof tile. The hall measures five kan (a unit of measurement referring to the distance between two columns) at the front and three kan at the sides, and has a gabled roof resembling the Chinese character 人. 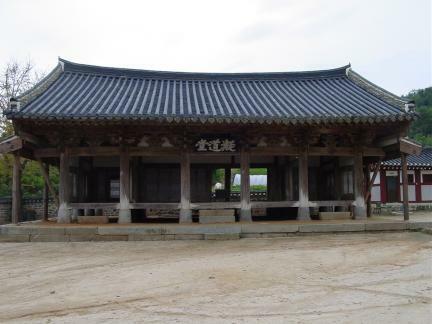 Although it is unusually large for a Confucian lecture hall built during the latter part of the Joseon Dynasty, it faithfully reflects the architectural style of the time, and is regarded as a valuable material for research on the construction of halls during the mid-Joseon period.